When Joe Owen moved into his century-old Victorian home, he knew it needed a lot of work, but he saw the potential it held. However, as an over-the-road truck driver who was rarely at home, what he didn't see was how much work his neighborhood needed. Located near downtown Rockford , Illinois , Owen's community – like many older communities within close proximity to the city – had become a victim of neglect and had become worn down over time. It wouldn't be until Owen took on a job for which he did not have to travel that he recognized the severity of the problem, and it wasn't until he realized that he had a personal responsibility to do something about it that things began to turn around. Prostitutes walking up and down the streets. Open air drug markets. Gangs hanging out on street corners. Multiple abandoned and vacant homes. Neglected properties. This was no movie set; it was Joe Owen's very own neighborhood. "The more time I spent at home, the more I began to see things that were totally unacceptable," says Owen. As a result of years of neglect and a faltering economy, Owen's town had become infested with problems that were strangling the integrity from the once thriving community – a community that had formerly served as home to mayors, bank owners, and industry leaders. That was no longer the case, and Owen refused to be complacent. He joined his local neighborhood association to determine what could be done to address the issues. "I kept saying, 'Why don't THEY do something about this? '", recalls Owen. "Then, as I was doing some research, I read those very words, and the question, 'In what part of they do you see yourself?' That's when it dawned on me that I was a part of they, and I needed to take responsibility for making changes." Owen's revelation prompted him to throw his hat in the ring – though reluctantly – for the position of vice president of his neighborhood association, the ORCHiD 3 rd Union College Neighborhood Association, a group that had been formed as a result of a collaboration between two bordering groups, the Old Rockford College Historic District Neighborhood Association and the 3 rd Union College Neighborhood Association. Owen won, and things began to get very interesting. "I told the board we needed to do more than just talk. I said, 'If we say something, we have follow through and do it, and I will hold everyone's feet to the fire to make sure that happens.'" His enthusiasm and commitment to initiate change proved to be too much for some members of the board, and several ultimately resigned their positions. Soon after, however, other community members stepped up and demonstrated their willingness to take on the challenge. According to Owen, the new group "clicks." "We have a wide range of ideas and opinions, and what's really good about it is that, while on many occasions we don't agree, we agree to disagree and always come to a compromise." said Owen. Ever since, the board has been doing more than just talking the talk; it's been walking the walk . . . literally. After the new board was installed, each went door to door in the neighborhood, talking with neighbors about their concerns and getting a handle on where the illegal activity was coming from. Armed with the information they collected, the board devoted itself to finding a way to turn the neighborhood into a location not where people had to live because of their socioeconomic situation, but a place where people wanted to live. As part of the transformation process, Owen conducted a good deal of research. While perusing the Internet, he came across the USAonWatch website and uncovered information he says was pivotal in his endeavors. "What a wealth of information I found on the website," recalls Owen. "I immediately ordered plans on formulating block watches and making neighborhoods less attractive to the criminal element, which were extremely helpful resources." A list of block captains was then created, and was published in the local newspaper. 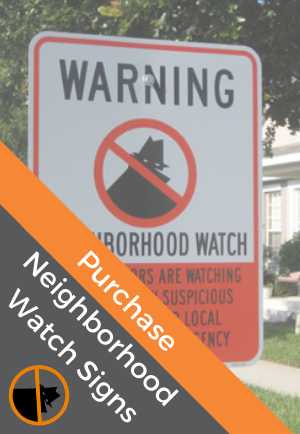 Local representatives provided Neighborhood Watch signs that were distributed throughout the community and placed in windows. And, perhaps most importantly, residents began to network and communicate with one another. "Whereas at one point, many of us didn't know the neighbor who lived next door to us, now, if someone spots a suspicious vehicle or hears shots being fired, that person will call the block captain responsible for that area," explains Owen. "Neighbors know each other and are talking to one another." And communication with community police, which is supported by regular emails and telephone calls, has also dramatically improved. This communication has spawned a new excitement to tackle community problems, and along with this excitement, a slew of programs and events ORCHiD has sponsored. While the neighborhood has long held community clean ups, Owen says last year's was done with a new fervor. "We knocked on doors, collaborated with some faith-based organizations, and even enjoyed the support of some of our officials, such as our assistant state's attorney and the mayor, who showed up to say that we were doing a great job," says Owen. "That gave morale a great boost." Following the success of the event, the board planned a block party – and one that proved to be far from the norm. This one was designed to send a clear message to criminals. "There are some streets in our neighborhood that any normal tax paying citizen would not dare walk down because they are so gang infested that chances of getting away unharmed are unlikely," explains Owen. It was among these very crime-ridden streets that Owen and the board decided they would hold their block party. “We simply told the drug dealers that they would have to do business somewhere else,” says Owen, who said he and the board assured residents that police would be present to thwart any potential problems. "We wound up having a great party with a very high turnout." Beautifying the community and giving every resident a sense of ownership – whether a homeowner or renter – is another focus of the group. Its Community Garden project will allow those who live in apartment buildings the opportunity to grow their own vegetables in a garden that all members of the community will have access to. Also planned is a neighborhood tool bank, which will allow residents to borrow gardening equipment from a stocked shed. 2007 will bring about even bigger things for ORCHiD. The neighborhood will be the site of National Night Out festivities, will be working with Habitat for Humanity to build single family homes for those in need, and will be developing a community resource center, which will serve as one-stop shop offering a variety of resources, from providing information to those who are interested in renting or purchasing a property, to those seeking an after school program for their child. Like the house he envisioned would one day be restored to the original luster it once had at the turn of the last century, so too does Owen have the same vision for his neighborhood. And that vision is beginning to be realized.